Whether it’s an end of summer gathering or an early fall bonfire, a beautiful yard is essential to ensuring that both you and your guests are relaxed and comfortable on a beautiful day (or night!) A beautiful patio designed with entertaining guests in mind can serve as the centerpiece of not only your gathering, but the entire landscape. Stone pavers easily form the foundation for the area you want to entertain guests in. Pavers are a great material to work with because they require little effort to maintain, repair is easy, and they are extremely durable. 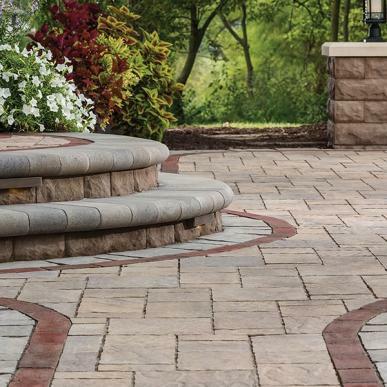 One of the first things you’re going to want to consider is what specific paver you are going to use. Luckily paving stones come in a wide variety of textures and colors, so you can always find something stylish that complements your yard. We recommend Belgard pavers as they offer a diverse range of eye catching paving stones with styles ranging from classic to contemporary. Not only does Belgard offer a wide range of styles to choose from, but they also offer various types of pavers including traditional stone pavers; permeable pavers, which allow the rain that falls on your patio to seep back into the ground, reducing the burden on storm drains; and outdoor porcelain pavers, which are similar to indoor porcelain tiles, only thicker and more durable. which is great for contemporary designs!. For nighttime hangouts, great patio landscape design lighting is a must. You’d be surprised how just how much well-designed lighting ties your entertaining area together. There are many outdoor lighting options, such as sconces attached to your home, standing lantern posts, or even hanging lights. Most importantly your lighting needs to reflect the style and vision you have for your landscape. We recommend Kichler Lighting as they provide a wide assortment of products for all of your outdoor lighting needs. For more great ideas for lighting your landscape, see our article Inspiration for Landscape Lighting. In order to keep your guests comfortable and relaxed seating areas are an absolute necessity when entertaining on your patio. There are many options for seating your guests. The most common option is patio furniture as it comes in a wide variety of styles, colors, and materials giving you the flexibility of finding what fits perfectly in your yard. An often overlooked option for seating comes in the form of retaining walls. Yes, retaining walls can double as seating for your guests! To double as a seating area you should plan on your retaining wall being around 2 feet tall, and don’t forget that using different colored or sized blocks can greatly compliment your patio. In addition, consider planting flowers just behind the seating to provide your guests with something beautiful to look at with a soothing fragrance – they’re also great for pictures! For more outdoor design ideas check out our article Landscape Design for Entertaining. 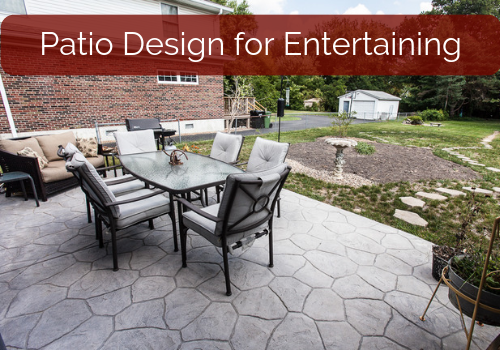 Ready to start planning your patio for entertaining guests? Give us a call at (636) 688-6647, we love doing custom work and will happily design the perfect patio for you.